A male infant was born to a 23-year-old woman with intermittent prenatal care, at 35 weeks and 2 days gestation. The prenatal ultrasound revealed a 10-fold risk of Trisomy 21 based on nuchal translucency; however, additional workup, including a fetal echocardiogram, was not performed. On the day of birth, an obstetric ultrasound revealed oligohydramnios and intrauterine growth restriction with the fetus at less than the first percentile, therefore, induction of labor ensued and the baby was born via uncomplicated vaginal delivery. After birth, continuous positive airway pressure at 5 mmHg and supplemental oxygen at 50% was instituted due to clinical cyanosis and poor respiratory effort, with a resulting oxygen saturation of 70%. The Apgar scores were 7 and 9. On physical examination there was typical facies associated with Trisomy 21 and a 2-3/6 holosystolic murmur was auscultated at the left lower sternal border. Genetic testing confirmed karyotype 47, XY + 21. 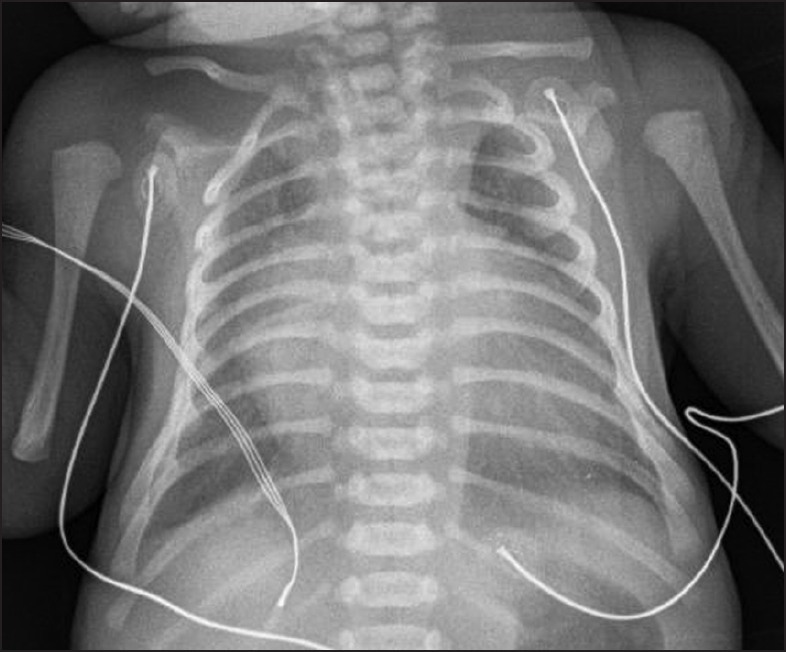 A chest X-ray revealed significant cardiomegaly and increased pulmonary vascularity [Figure 1]. An electrocardiogram (EKG) demonstrated sinus rhythm, right atrial enlargement, intraventricular conduction delay, with an extreme rightward axis, and no pre-excitation. 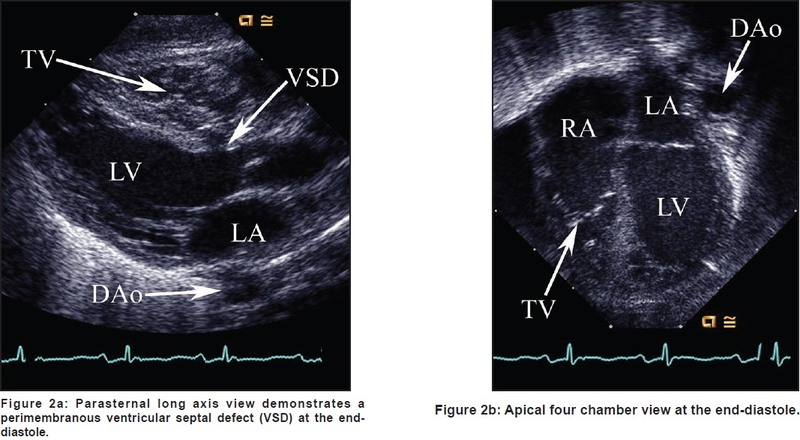 Transthoracic echocardiography performed on the first day of life [Figure 2]a-b revealed (S,D,S) normal segmental anatomy with atrioventricular and ventriculoarterial concordance. An apically displaced and tethered tricuspid septal leaflet, with a deficient posterior leaflet, resulted in mild-to-moderate tricuspid regurgitation. The right atrium (atrialized ventricle) was dilated with a right-to-left flow across a stretched patent foramen ovale. There was a moderate perimembranous ventricular septal defect (VSD) with muscular extension and mostly left-to-right flow, at a low velocity, which predicted a peak gradient of 14 mmHg. The pulmonary valve was normal without stenosis or regurgitation. A large ductus arteriosus shunted left-right on the initial echocardiogram. The left ventricular morphology was normal. The patient was monitored in the Neonatal Intensive Care Unit (NICU). Once ductal closure had been confirmed on day of life #6 and as oxygen saturations remained above 90%, ensuring adequate pulmonary blood flow, the patient was discharged home on day of life #25, with close follow up and consideration of surgical intervention once symptomatic. Following initial discharge, the patient was readmitted multiple times to the hospital for failure to thrive despite maximal caloric intake. Therefore, the patient underwent tricuspid valvuloplasty and VSD closure, with maintenance of an atrial level communication on day of life #108. A postoperative echocardiogram revealed moderate-to-severe tricuspid regurgitation, estimating a gradient of 39 mmHg from right ventricle to right atrium and right-to-left shunting across the atrial communication. Initially, weight gain was steady and oxygen saturations remained above 80%; however, over several months the patient again failed to gain weight despite adequate caloric intake. An echocardiogram 6.5 months postoperatively [Figure 3]a-c demonstrated severe tricuspid regurgitation, right-to-left shunting across the atrial communication, and new mild left upper pulmonary vein stenosis, with a mean gradient of 3-4 mmHg. Cardiac catheterization revealed diffuse pulmonary vein hypoplasia and left-sided pulmonary vein stenosis, with mean gradients of 4-11 mmHg. Repeat surgical intervention of the tricuspid valve was considered, however, given the low likelihood of improvement on account of pulmonary vascular disease and high-expected morbidity, surgery was not recommended. Ebstein anomaly, first described by Wilhelm Ebstein, in 1866, is characterized by inferior displacement and rotation of the septal and posterior leaflets of the tricuspid valve, resulting in a diminutive right ventricle. Its incidence is approximately 5.2 in 100,000 births and it is associated with additional cardiac anomalies in 38.3%. There is no known cause for this anomaly and it is not commonly associated with specific chromosomal abnormalities. For this patient, it was necessary to determine if the RV was adequate in size and the pulmonary vascular resistance fell normally to allow adequate antegrade pulmonary blood flow if the VSD was closed. Initially, postoperative oxygen saturations suggested adequate pulmonary blood flow; however, development of pulmonary vein stenosis likely contributed to increased tricuspid regurgitation and right ventricular failure. There were no additional surgical options given the degree of pulmonary vein stenosis and pulmonary vascular disease. As the guidelines suggest, all patients with suspected Trisomy 21 should undergo routine echocardiography to rule out congenital heart disease. 1. Rowe RD, Uchida IA. Cardiac malformation in Mongolism: A prospective study of 184 Mongoloid children. Am J Med 1961;31:726-35. 2. Vida VL, Barnoya J, Larrazabal LA, Gaitan G, de Maria Garcia F, Castaneda AR. Congenital cardiac disease in children with Down's Syndrome in Guatemala. Cardiol Young 2005;15:286-90. 3. Park SC, Mathews RA, Zuberbuhler JR, Rowe RD, Neches WH, Lenox CC. Down Syndrome with congenital heart malformation. Am J Dis Child 1977;131:29-33. 4. Tandon R, Edwards JE. Cardiac malformations associated with Down's Syndrome. Circulation 1973;47:1349-55. 5. Bauk L, Espinola-Zavaleta N, Munoz-Castellanos L. Ebstein's malformation in the setting of Down's Syndrome. Cardiol Young 2003;13:370-2. 7. Johnson CD, Ortiz-Colom PM, Sainz de la Pena H, Barroso E. Ebstein's Anomaly in a patient with Down's Syndrome. Bol Asoc Med P R 1989;81:221-2. 8. Leite Mde F, Gianisella RB, Zielinsky P. Intrauterine detection of ebstein's anomaly and Down's Syndrome. Prenatal diagnosis of a rare combination. Arq Bras Cardiol 2004;82:390-5. 9. Silva SR, Bruner JP, Moore CA. Prenatal diagnosis of Down's Syndrome in the presence of isolated Ebstein's anomaly. Fetal Diagn Ther 1999;14:149-51. 10. Venturini E, Musaio L, Strazzeri R, Baroni F. Ebstein's tricuspid anomaly and Down's Syndrome. A clinical case report. Recenti Prog Med 1992;83:556-8. 11. van Son JA, Konstantinov IE, Zimmermann V. Wilhelm Ebstein and Ebstein's malformation. Eur J Cardiothorac Surg 2001;20:1082-5. 12. Correa-Villasenor A, Ferencz C, Neill CA, Wilson PD, Boughman JA. Ebstein's malformation of the tricuspid valve: Genetic and environmental factors. The Baltimore-Washington Infant Study Group. Teratology 1994;50:137-47.